This picture was taken right after Lisa and TJ were announced as husband and wife. They are walking back down the aisle holding hands and laughing with smiles from ear to ear. This is one of my favorite moments of every wedding day and always has such raw emotion. Lisa and TJ’s elegant wedding took place at The Willow Ballroom and Event Center in Hood California. They started the festivities off with a first look down at the Willow Ballrooms’s estate and vineyards in the delta town of Courtland. After taking their first look photos in the vineyards and garden areas. They headed back to the event center for their ceremony and reception. 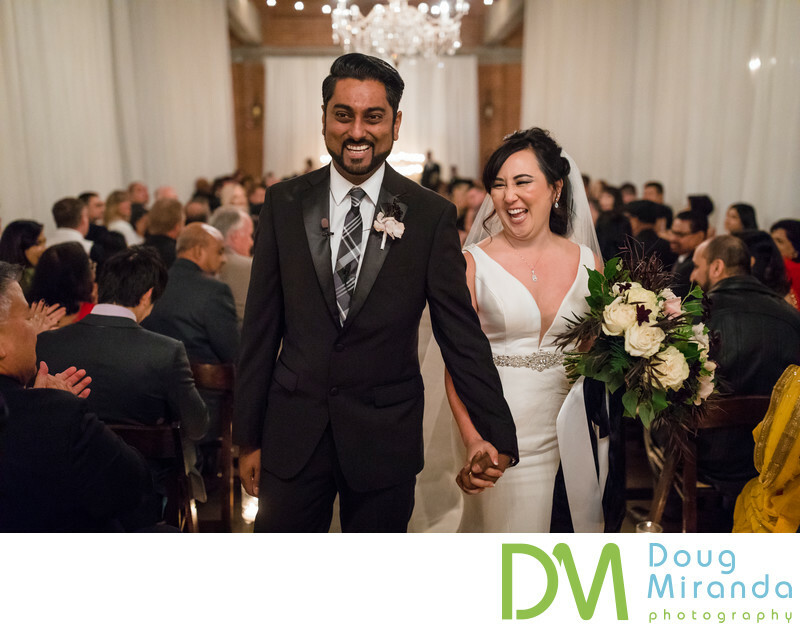 With their wedding taking place on cool November afternoon everyone stayed warm with the indoor ceremony and reception in the old warehouse. The Willow Ballroom is located in the California Delta just out side of Sacramento and is one of the top wedding venues and event centers in the region. The large 11,000 square foot warehouse is located right on the banks of the Sacramento on the river. It has an urban rustic charm that is perfect for creating the wedding of your dreams. Even though it’s just 15 miles for downtown Sacramento, you feel as though you have left the city and are out in the country side with no one around for miles. You loose all those city noise and are left with the sounds of birds and rushing water from the river. This venue is a true gem of the Delta region and Sacramento. Wedding Venue, Willow Ballroom and Event Center. Wedding planner by Belle & Barrister Custom Events. Flowers and arrangements by Bella Bloom Flowers. DJ and lighting by Nick of Function 45 DJ. Food and Drinks by Jackson Catering. Location: 10724 CA-160, Hood, CA 95639. Keywords: Willow Ballroom & Event Center (27).